I thanked him politely for the warnings–and made no cancellations to the car reservation. The beautiful views of the sea and having the leisure of our own timeline and itinerary made me stubborn. I was determined. Besides, I knew my days dabbling in canyon carving hadn’t gone completely to waste. If one knew the basics of driving physics, how could she go wrong? The Amalfi Coast was toast. Still. I insisted we paid the additional 80 Euros so that our damage and theft deductibles would be 100/200 Euros instead of 800/1600. The car rental company helped out by providing a Club-like contraption with the cover of a … yellow flourescent bat. I think I used it once–after all, we weren’t staying in Naples. When we picked up our little Panda, the small size of the Fiat made me sufficiently confident. The confidence of course was unfounded. I found that the small size was actually imperative. It was an Italian car, and we were driving in Italy. Only 24,000 km young, she came with 3 fat fender dents and 2 bumper scratches, all listed on the contract (check). Driving out of Naples, I made a couple turns across 2 lanes to catch “Autostrada” entrances and doubled back at least 3 times to catch one-way roundabouts around Piazzas (city squares). I mean, if you could call them lanes. In reality everyone’s just in a big group moving in 8 different directions en masse. That was just Naples–and when you’re a tourist, that’s what the public transportation buses are for. Coast driving is an entirely different animal. In hindsight, I wish Roycifer had videoed the hairpin turns except to say that they were rather mild since I took them slow–save for the oncoming traffic. When the tires (I noticed the Panda had Conti’s) were squeaking at 15 km/hr, I wasn’t about to push. But what was probably more exciting at the hairpins was my finding the exact spot to pull over to a side stone wall so that a tour bus could make said hairpin without reversing and doing a mini Y maneuver. And then there are the stone alleyways in each town. As we rolled down our windows to fold in our sideview mirrors so we could barely make it through, I wondered who pays more money in Italy to move up in a rental car class to rent a larger car in the name of comfort!? I could count literally 2 inches to the scratched up terra cotta on either side of my sideview mirrors (6 inches with them pulled in). This includes an alleyway right up to the parking lot of our hotel in Ravello, the destination of Sko and Joe‘s wedding. Another extraordinarily tight alleyway I shared with an oncoming moped in Sorrento. Again, some more doubling back through crazy alleys thanks to unmarked one-way streets. She stopped completely as I squeezed through–she stood on the leg nearest the wall and drew her other leg onto the scooter as she leaned her entire body towards that wall, making her handlebars as flush as possible. As I drove past I waved; she glared. As for the driving affording beautiful scenic routes (much thanks to Caleb for the native-like navigation skillz), I knew that as long as I wasn’t panicking and breaking in the middle of turns and instead powering through them I’d be okay. I did my breaking before the turns, and kept my sights ahead and anticipated the traffic. Truth be told, there’s good reason lane paint is only a suggestion. Why invite more body roll and decreased stability? I kept the inertia laws in mind and made straightaways out of mild S turns. Interestingly enough, I found myself in 2nd gear practically the entire time (that is through every turn) and in 3rd only rarely (in the straightaways). We smelt rubber on a couple occasions. It was 5 days later when we returned her with the original 3 fender dents and 2 bumper scratches. P.S. – Oh, right. Regarding the actual Italy leg of my vacation sans driving, The Amalfi Coast is the most beautiful scenery I have ever experienced my entire life. Plenty more entries about that–but thought I’d humor you about the fears of driving first. 😉 And that’s not even covering our amazing visit to the Pompeii excavations. Lots and lots more to come! For now, you can peak at my Flickr photos while I’m uploading a whole crapload. It’s taking awhile since I haven’t had reliable internet in so long so please bear with me. The posts will be coordinated, too. 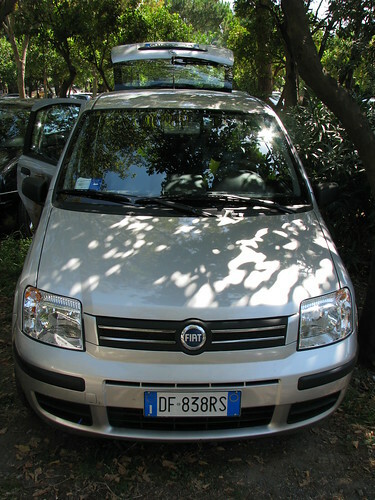 This entry was posted in Travel and tagged amalfi coast, driving, fiat, fiat panda, italy, naples. Bookmark the permalink.